Seek professional opinion and treatment about your Finger Joint deformity today. Call us Call us +65 97731458 to schedule for an appointment. Bony bumps on the finger joint closest to the fingernail are called Heberden’s nodes. Bony bumps on the middle joint of the finger are known as Bouchard’s nodes. Bony bumps are also common at the base of the thumb. These bumps do not have a nickname, but the joint is called the CMC or carpometacarpal joint. 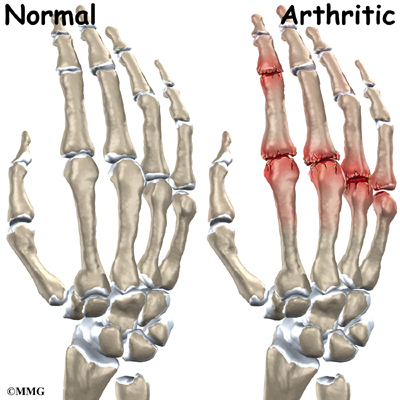 The name comes from the bone of the wrist (carpal) and the bone of the thumb (metacarpal). Heberden’s nodes typically develop in middle age, beginning either with a chronic swelling of the affected joints or the sudden painful onset of redness, numbness, and loss of manual dexterity. This initial inflammation and pain eventually subsides, and the patient is left with a permanent bony outgrowth that often skews the fingertip sideways. Bouchard’s nodes may also be present; these are similar bony growths in the proximal interphalangeal (PIP) joints (middle joints of the fingers), and are also associated with osteoarthritis. Heberden’s nodes are more common in women than in men, and there seems to be a genetic component involved in predisposition to the condition.